Sowbugs unlike Pillbugs have two prominent tail-like appendages that prevent them from rolling up completely like the Pillbug. 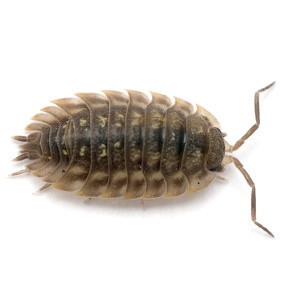 Habits: Pillbugs and Sowbugs are scavengers and feed on decaying organic matter, but occasionally on dead animals. Habitat: Lacking closing devices for their respiratory system and an outer waxy layer on their exoskeleton, Pillbugs require environments with high moisture content to prevent dehydration. Their nocturnal habits reduce water loss. In the day time you can find them around building, under trash, boards, pots, piles of grass clippings, and other decaying vegetation. Threats: Pillbugs and Sowbugs are nuisance pests but pose no threat.